in car tapedeck: Art of Noise, Best of Art of Noise. It now sounds like I'm in an 80s police film as a drive! my condition: sad, hoping my efforts succeed the way I hope. Destiny and I park across the street and saunter over to the South Moorhead sale. First, I think, "Score! T'Pau and Art of Noise cassettes!" There's a handful of scifi novels -- and, the young couple, around my age, had notified us upon arrival that everything was half off. Everything I liked had originally been marked 50 cents. There was even a Boba Fett pez dispenser. I regret not picking up the Fett pez, but I did select a Neal Stephenson novel and three of the Art of Noise cassettes. A painful thought then crossed my mind. Mostly, the cool stuff at garage sales is cool for it's kitch value. They're old big-eyed kid paintings, or children's book-and-record sets. Usually if there's something cool, it's because the college student kid was asked to put some stuff out on the tables, and he wants near-retail for them. This garage sale, however, pushes things to another level. The items are genuinely cool, but they're genuinely garage-sale. This couple (the woman I sorta recognize from my youth) were cleaning out useless stuff, and selling it for dirt cheap to clear space. That's supposed to happen to crap from my parents' era -- how can young, cool people part with it? It makes me old to say, "can you believe these people are selling this stuff for a quarter? They're crazy!" Those things are said by 40-somethings upon finding a stash of macrame plant-hangers or Bill Cosby LPs. Are Fine Young Cannibals, Edie Brickell, and Lita Ford so un-hip now that they're marked DOWN from $0.50? I make my purchase, and we drop off my items at the car before checking another garage sale across the street. On our way back to the car, I switch my pince-nez glasses for my mirrorshades, and I straighten my New Jersey Transit t-shirt as my bowling shoes tread the pavement. We settle ourselves in the car. 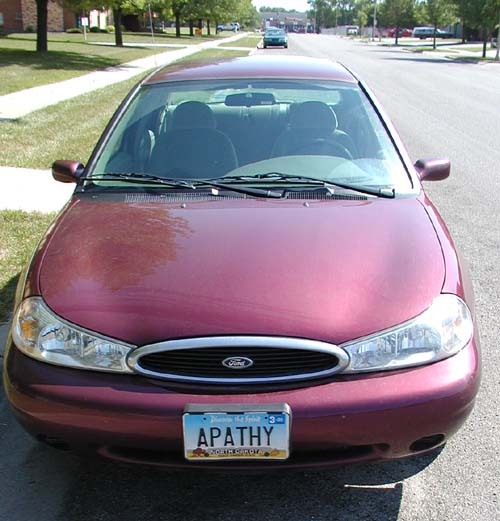 I pull into the ex-hipsters' driveway to turn around, pausing long enough for them to see my APATHY license plate. I crank up the Macy Gray, and we pull away. I am not ex-hip. I am still cool. You cannot stop me. Soon, CafePress is opening a self-publishing option. No setup fees, no minimum quantities, and you can offer bound printed materials to your customers. Earlier today, a visitor to The Books of Dog asked what it'd take to buy The Books of Dog. The gears are meshing...in a few weeks, The Books of Dog may be available for all, smartly bound and in full color. Garage sales, garage sales. I stop at one, and find the prospects disappointing. Leftover craft yarn, miscellaneous useless things, clothes. Under the end of a table, I spy a box. It's the kind that bulk paper comes in, open top with the cover missing. Inside are a dozen bowling and volleyball trophies. Taped to the box's exterior is a piece of lined notebook paper. In a girlish script is written 4 letters -- "FREE". I pick up the box and head to the front table, where two teen girls sat. "I'm taking your free box," I say. They don't say OK, they just kind of stare at me. They don't object, either, so I take my box of faux gold and marble treasures and drive away.